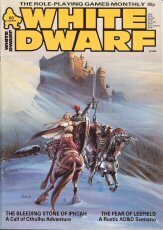 ARTICLES: Combat and armour class; Fiend Factory, by Don Turnbull; A place in the wilderness, by Lew Pulsipher; Traveller: The new SF role-playing game reviewed, by Don Turnbull; Kalgar: The sword & Sorcery hero written and drawn by David Lloyd; more. 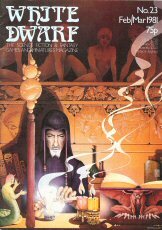 ARTICLES: Feudal economics in C&S (Chivalry & Sorcery) by Ed Simbalist; Lair of the Demon Queen: A mini-dungeon complex, by Don Turnbull; Thoughts on the proliferation of magic items in D&D: Advice on the use of magic items by Gary Gygax; more. 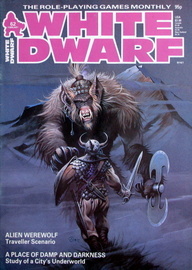 ARTICLES: Monster Modelling; Man-beast: A ferocious new character class; Kalgar: The sword & Sorcery hero written and drawn by David Lloyd; Valley of the Four Winds: A new story of heroic adventure, written by Rowland Flynn; more. 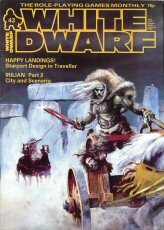 ARTICLES: The experienced traveller: Incorporating experience into Traveller; Valley of the Four Winds, Chapter Two: Battle of Gondemar; The Lichway, a complete mini-dungeon; Kalgar; Foresters: A C&S character type by Trevor Clarke and Ed Simbalist; more. 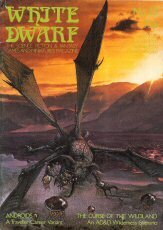 ARTICLES: Talismans of Tekumel: Magical items for EPT (Empire of the Petal Throne); Light Sword: An SF duelling game designed by Wilf Backhaus; The Experienced Traveller, part two; Valley of the Four Winds, chapter three: In Greengorm Forest; more. 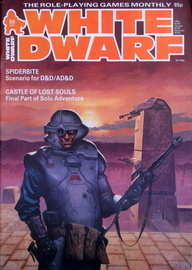 ARTICLES: Firearms 3000AD: Weapon additions for Traveller; A Barroom brawl: A ready made scenario using D&D rules by Lew Pulsipher; Humanoid variations: New aliens; Valley of the Four winds, chapter four: Towards the Stonefingers; more. 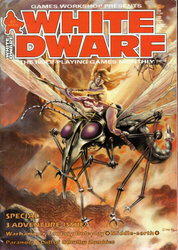 CONTENTS: THE FIEND FACTORY: An assortment of readers' monsters edited by Don Turnbull; USEFUL DUNGEON EQUIPMENT: New backpack items by Lew Pulsipher; OPEN BOX: SF/F games review; SPELLMAKER: Suggested revisions by the inventor, Eric Solomon; NEWS: What's happening in the SF/F games world; MOLTEN MAGIC: SF/F miniature figures review; POOL OF THE STANDING STONES: A complete mini-dungeon by Bill Howard; VALLEY OF THE FOUR WINDS: Chapter Five: The Hall of Wizardry; TREASURE CHEST: A miscellany of D&D additions; A DIP INTO THE PLAYERS HANDBOOK: Advanced D&D examined by Don Turnbull; more. 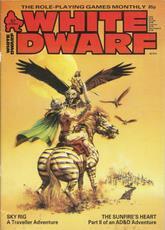 CONTENTS: Advanced D&D Combat Tables by Gary Gygax; Expanding Universe - Suggested additions to Traveller by Andy Slack; Houri - An alluring female character class; Valley of the Four Winds - Fianl doom for Farrondil? by Rowland Flynn; more. 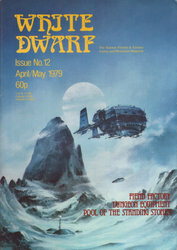 CONTENTS: Expanding Universe Part II - Suggested additions to Traveller by Andy Slack; Lair of the White Wyrm - A complete Runequest mini-scenario by John Bethell; White Dwarf Interview - Gary Gygax, the man who made it all possible by Ian Livingstone; more. 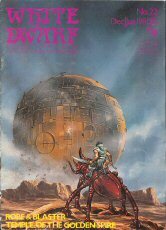 CONTENTS: The Barbarian - A Mini-Boardgame; Expanding Universe - Traveller Additions; Depths of the Earth - Running D&D Modules; more. 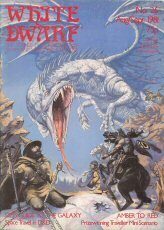 CONTENTS: Chronicle Monsters - The application of the Thomas Covenant Trilogy to D&D by Lewis Pulsipher; Expanding Universe Part IV - Suggested additions to Traveller by Andy Slack; Boot Hill - Wild West encounters; The Paths of Lil - A complete Gamma World mini-scenario; more. 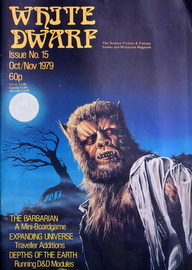 CONTENTS: My Life as a Werebear - D&D Monster Character Classes by Lewis Pulsipher; The Magic Brush - Figure Painting as an Art; The Sable Rose Affair - Task Force Traveller mini-adventure; White Dwarf Interview - Greg Stafford of The Chaosium by Ian Livingstone; Perception - A new D&D requisite; more. 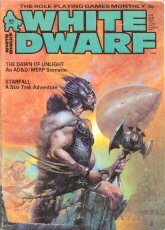 CONTENTS: Star Trek - The Motion Picture (Miniature Rules and Scenario); Halls of Tizun Thane (D&D module); Magic Brush (Figure Painting as an Art, pt 2); more. 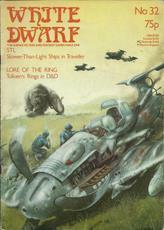 CONTENTS: Dungeons & Dragoons - Troops through the Ages in D&D; Star Patrol - Scout Service in Traveller by Andy Slack; Grakt's Crag - A complete D&D mini-module; Conversion - A new Clerical ability; more. CONTENTS: Lore of the Land - Thomas Covenant applications to D&D; Survival! 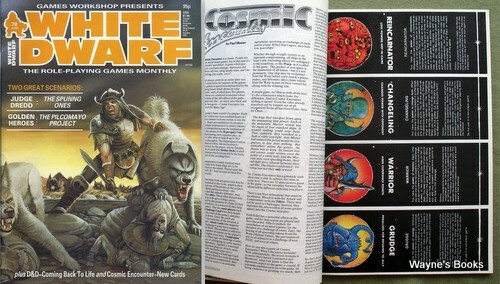 - Science Fiction Mini-Boardgame; Tomb of the Maharaja - Complete AD&D Mini-Module; more. 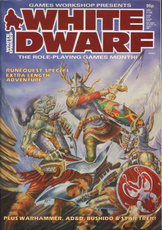 CONTENTS: Games Day '80 - A pictoral report; 3D Dungeon Design - How to build dungeon modules; Robe & Blaster - Aristocracy in Traveller by Rick Stuart; Search for the Temple of the Golden Spire - The Dragonmeet III Competition Dungeon; What the Numbers Mean - Explanations of D&D statistics; more. 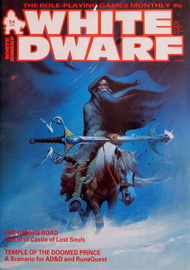 CONTENTS: An Introduction to Dungeons & Dragons: First in a series explaining the game by Lewis Pulsipher; An interview with Marc Miller, the inventor of Traveller; The Hive of the Hrrr'l: A D&D mini-module featuring the prize-winning Flymen; A Spellcaster's Guide to Arcane Power: Power-point magic in D&D; Character Conjuring: Elementalists — a new D&D magic-using subclass edited by Andy Slack; more. 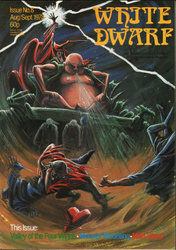 CONTENTS: An introduction to Dungeons & Dragons Part II - Dungeon Mastering Styles by Lewis Pulsipher; Backdrop of Stars - Setting up Traveller campaigns by Andy Slack; The Lair of Maldred the Mighty - The winner of the D&D mini-module competition; Alignment in Role-Playing Games; more. CONTENTS: An introduction to Dungeons & Dragons Part III - Spell Using classes by Lewis Pulsipher; Creature Quiz; The Self-Made Traveller - Optional skill acquisition for Traveller characters; The Dungeon Architect Part I - The Interesting Dungeon; Lower Canon Court - A clerical AD&D skirmish; Blowout - vacc suits in Traveller; more. 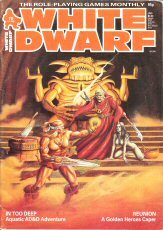 CONTENTS: Dungeon Master's Guide to the Galaxy - Space travel in D&D; The Dungeon Architect Part II - The Constructed Dungeon; Amber to Red - The prize-winning Traveller scenario; An introduction to Dungeons & Dragons Part IV - Fighters and Thieves by Lewis Pulsipher; more. CONTENTS: The Dungeon Architect Part 3 - The Poplulated Dungeon; The Imperial Secret Service - A new Traveller Career; An Introduction to Dungeons & Dragons Part V - Characterisation and Alignment by Lewis Pulsipher; The Dungeon at the End of the Universe - Space combat in D&D; Hell's Portal - An AD&D mini-scenario; more. 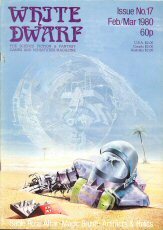 CONTENTS: The Magic Jar: Converting characters from one RPG to another by Andy Slack; Operation Counterstrike: An interplanetary AD&D scenario by Marcus L Rowland; On Target: A Traveller hit location system; Games Day '81: A pictorial report by Ian Livingstone; Starbase: Sorry! — a Traveller mini-scenario; more. 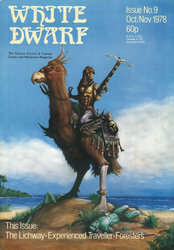 CONTENTS: Designing a Quasi-Medieval Society for D&D - part 1 - The Economy; Lucki Eddi - Being a tale of mighty Runequest deeds in far off Pavis; This is, of course, Impossible - How to tame time in AD&D; Weed War - An underwater Traveller scenario; more. 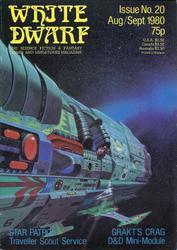 CONTENTS: Androids in Traveller: A bio-engineered career for Traveller by Roger Moore; Designing a Quasi-Medieval Society for D&D - Part 2: The Economy - Mercenaries and Resource Owners by Paul Vernon; Griselda Gets Her Men - Being a sequel to Lucky Eddi by Oliver Dickinson; The Curse of the Wildland: An AD&D adventure in the wilderness by Phil Masters; The Apocrypha according to St Andre: The genesis of Tunnels & Trolls Ken St Andre; RuneRites: Our new RuneQuest department starts with Unarmed Combat in RQ edited by Oliver Dickinson; more. 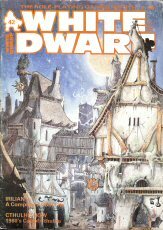 ARTICLES: Town Planner, part 1; Mad Dwarf - a T&T scenario, Prior Service in Traveller - alternative character generation system; Arms at the Ready - combining D&D combat tables; Crime and Punishment in Runequest; Additional Detector Systems for Traveller Starships; more. 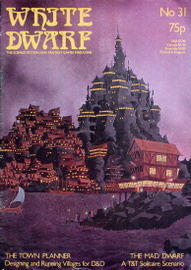 CONTENTS: Lore of the Ring - Tolkien's Rings in D&D; STL - Slower-Than-Light Ships in Traveller; The Town Planner - Part II Designing Towns and Cities; A World of Your Own - Devising a style of play in T&T; Chaos from Mount Dorren - An AD&D mini-scenario; more. 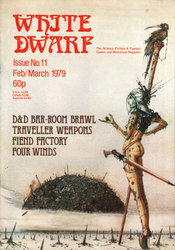 CONTENTS: Weapons for Traveller: An array of readers' weaponry; The Town Planner Part III: Running Towns and Cities; Rumble at the Tin Inn: Bar-Room Brawl, RuneQuest style; Arms at the Ready, Part II - A further selection of weapons for D&D; Brevet Rank for Low Level Characters: How to play at 10th level when you're only 2nd by Lewis Pulsipher; Starbase: Guns for Sale; RuneRites: Invisibility & Magic; more. 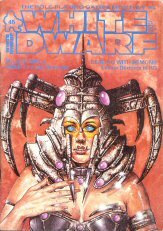 CONTENTS: Droids (Robots for Traveller); A Guide to Dungeonmastering (Part 1: Seting Up Adventures); Trouble at Embertrees (Epic AD&D scenario); Vrak and Nachak (new monsters for Runequest); Morality in Traveller; Undead Monsters for AD&D; more. 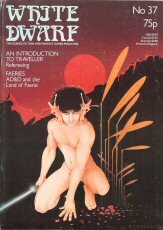 CONTENTS: Faeries in AD&D; Introduction to Traveller - Part II, Refereeing Traveller; Bloodsuckers - ecology of the vampire; The City in the Swamp - reptilian scenario for AD&D; D&D Scenarios - ideas for adventures; more. 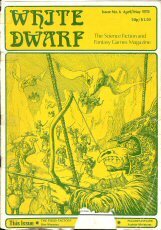 Khazad Dum - A Tolkien Scenario for D&D. How to make the most of your monsters. more. 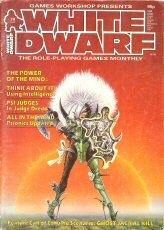 CONTENTS: RuneBlades - Cult special weapons in RuneQuest; Introduction to Traveller, Part IV Campaigns; Slayground - A Champions superhero scenario; The Daughter of Danu (AD&D scenario); The behaviour pattern of the monster in AD&D; more. 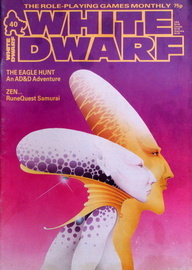 CONTENTS: Runequest in Samurai Japan; Rules for Pitched Battle in AD&D; Eagle Hunt - AD&D excursion into the assassin's stronghold; New scout ship for Traveller; more. 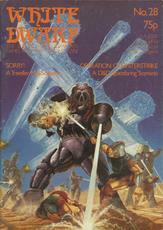 CONTENTS: Battleplan! 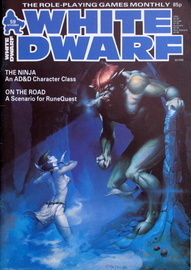 - The Tactics of Dwarves, Elves, Kobolds and Orcs; A Tasty Morsel: RuneQuest Fiction; Sorcerous Symbols: Sigils in AD&D; The Snowbird Mystery: An undercover Traveller adventure; Assignment: Freeway Deathride - A Car Wars Scenario; RuneRites: Unarmed Combat II; Fiend Factory: Inhuman Gods Part III; Starbase: The CSB, a new Imperial organisation; Treasure Chest: Discs as weapons in AD&D; more. CONTENTS: Cthulhu Now! 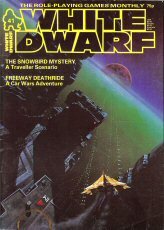 - Call of Cthulhu in the 1980s; To Catch a Thief - Crime perpetration in Traveller; Shamus Gets a Case - RuneQuest fiction in Pavis; Castles in the Air - Castle Theory in D&D; Irilian - Part 1 of a complete D&D city; more. CONTENTS: Cthulhu Now! 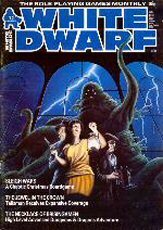 - Part 2: Mini-Scenario outlines for Call of Cthulhu in the 1980's BY Marcus L Rowland; Magimart: Buying and Selling Magic Items in FRP by Lew Pulsipher; Hanufa's Little Sister: Fiction from Glorantha by Oliver Dickinson; Irilian - Part 2 of our serialized AD&D city by Daniel Collerton; Happy Landings! 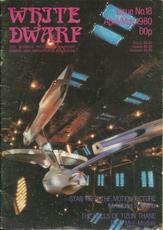 - Starport Design in Traveller by Thomas M Price; more. 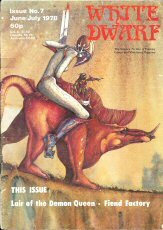 CONTENTS: Interstellar Charter Enterprises - An interstellar organization for Traveller by Marcus L Rowland; True Sight - Realism in D&D by Lew Pulsipher; Demonology in Runequest by Dave Morris; Irilian - Part 3 of the complete AD&D city plus scenario; more. 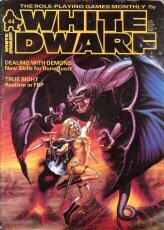 CONTENTS: Dealing with Demons - Part 2, The Lesser Demons in RuneQuest; Thieves' Toolkit in AD&D; Irilian - Part 4 of the complete AD&D city; Thistlewood - A Warhammer battle scenario; more. 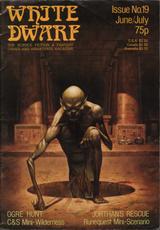 CONTENTS: Strangers in the Night: Wandering Monsters in D&D; Dealing with Demons - Part 3: The Greater Demons in RuneQuest; Worldly Power: Planetary Governments in Traveller; Irilian: Part 5 of the complete AD&D city; more. 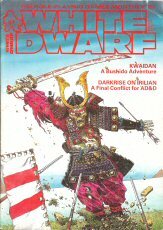 CONTENTS: The Demonist - new AD&D character class; Goblins in Runequest; Irilian - Part 6, The Final Conflict; Kwaidan - a ghostly Bushido adventure; more. CONTENTS: Stomp! 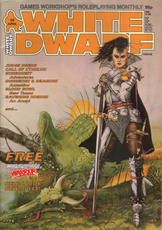 - Everything you wanted to know about giants in Warhammer; The Dark Brotherhood: A new look at assassins in AD&D; Crom Cruach: A new cult for the goblins in RuneQuest covered in the last issue; Database - Computers in Traveller; The Lone and Level Sands: An AD&D and RuneQuest demons scenario; more. 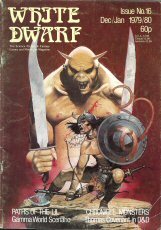 Part 1 of a two part AD&D campaign; The Goblin Cult of Kernu - A new cult for the goblins in Runequest; more. 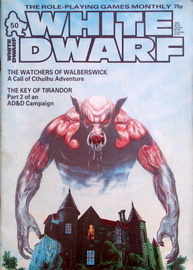 CONTENTS: A Few Small Formalities - Red Tape in Traveller; Divination and the Divine - Roleplaying Clerics (Dungeons & Dragons); The Watchers of Walberswick - Coastal scenario set in England, 1934 (Call of Cthulhu); The Key of Tirandor - Part 2: Inside the Lost City (AD&D); more. 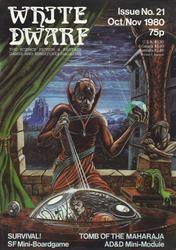 CONTENTS: Gift from the Gods - Clerical spells and the gods in AD&D; Thieves in Warhammer; All in the Family Fiction about Griselda in Glorantha; The Black Broo of Dyskund - A Runequest cavern crawl scenario; A Ballad of Times Past - An AD&D scenario with a difference for about 8 characters of 4th-5th level; more. 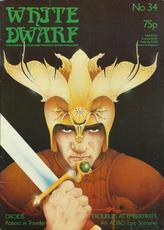 CONTENTS: The Name of the Game - An Introduction to Role-Playing for complete beginners; Bolts from the Blue - Deity-linked clerical spells for AD&D; To Live Forever - Immortality in Traveller; The Castle of Lost Souls - Part 1 of a solo fantasy game serial; The Serpent's Venom - A low-level AD&D scenario; more. 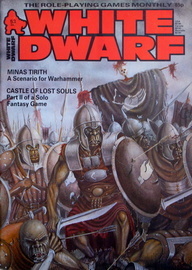 ARTICLES: The Name of the Game - Part 2 of an introduction to Role-Playing; Minas Tirith - The famous siege from Lord of the Rings for Warhammer (Joe Dever); The Naked Orc - A study of the orc in D&D; The Castle of Lost Souls - Part 2 of a solo fantasy game serial; more. 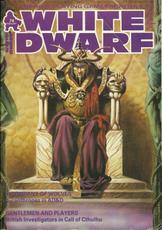 CONTENTS: The Law of Nature - Creating logical fantasy worlds; Visiting Other Plains - Barbarians in RuneQuest and other FRPGs; Name of the Game - Part 3: Science fiction role-playing games; The Castle of Lost Souls - Part 3 of our solo fantasy game; The Temple of the Doomed Prince - A medium level scenario for AD&D and Runequest; more. 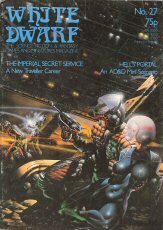 CONTENTS: Name of the Game - Part 4: Spies, superheroes and other role-playing games; Spiderbite - A low-level AD&D/Basic D&D scenario; The Unquiet Grave - Revenants in Runequest; Man and Beast - Animal Cults in D&D; Castle of Lost Souls - The Final Episode: Evil Eye; more. 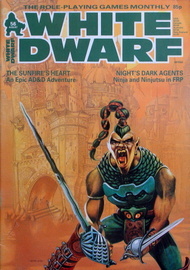 CONTENTS: Night's Dark Agents - Ninjas in fantasy roleplaying; The Belgariad in D&D; Treasure Chest - Technology in D&D; The Last Log - A scenario set on a distant planet far in the future (Call of Cthulhu); The Sunfire's Heart - Part one (AD&D); Plying the Spacelanes - Advanced ship encounters (Traveller); RuneRites - Combat rule additions (Runequest); more. 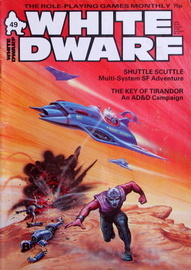 CONTENTS: Mind Over Matter (Psionics in AD&D); Sky Rig (Traveller adventure; orbiting refinery); Night's Dark Agents (ninjas); Sunfire's Heart, part 2 (AD&D adventure); Vampires in Runequest; more. 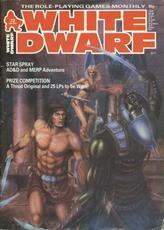 CONTENTS: It's a Trap - All about traps in D&D and role-playing games; Night's Dark Agents - Part 3 of our series on ninjas in role-playing games; Beyond the Final Frontier - Playing on after your character is dead; Strikeback - A time-travelling superhero scenario for Champions and Golden Heroes; For a Few Credits More - An analysis of money in Traveller; more. 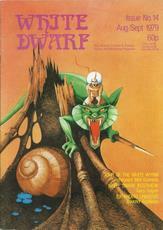 CONTENTS: The Mad Gods' Omelette - fiction by Dave Langford; The Ninja - An AD&D character class developed from Night's Dark Agents; A Matter of Faith - Ideologies as scenario outlines for contemporary games; Eye of Newt and Wing of Bat - Manufacturing Magic Items in AD&D - Part 1: The system, Staves, Wands and Scrolls; Hour of the Tiger - A special scenario for the Ninja; On the Road - A Runequest scenario set in a trading caravan; more. 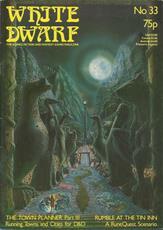 CONTENTS: Brewing up some nasty potions and rods, by Graeme Davis; Bleeding Stone of Iphtah (Call of Cthulhu scenario); Fear of Leefield (AD&D scenario); Treasure Chest; Fiend Factory; more. 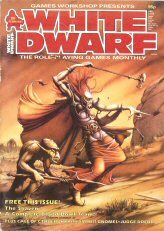 CONTENTS: Spice of Life - Alchemy in RuneQuest; Tempering with magic rings, armour and shields; Beyond the Shadow of a Dream - D&D/Fighting Fantasy scenario; Dark Usurper - Fighting Fantasy scenario; Days of Future Past - introduction to super hero gaming, pt 2; more. 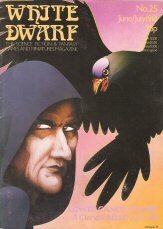 CONTENTS: A Place of Damp and Darkness - Life beneath fantasy cities; The Dark Usurper - An heir-raising escapade for Fighting Fantasy; En Garde - Parrying in AD&D; An Alien Werewolf in London - A Traveller loose in Victorian London; Eye of Newt and Wing of Bat - Penultimate instalment of our series on magic items; more. 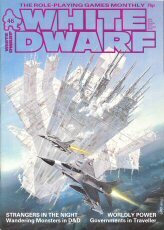 CONTENTS: News of the World - A look at government, law and conflict in fantasy campaigns; Starfall - A Star Trek adventure for 3-5 characters; Dawn of Unlight - MERP/AD&D scenario; Dark Agents of the Night - Handling modern-day ninja; more. 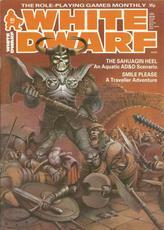 CONTENTS: Smile Please (Traveller adventure); Sahuagin Heel (AD&D adventure); Civilian Organizations for Traveller; Exotic weapons for AD&D; more. 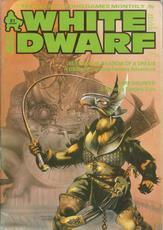 CONTENTS: The Road goes Ever On - Exploring the possibilities of Middle Earth Role-Playing by Graham Staplehurst; Ambush! 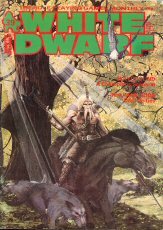 - Surprising behaviour for Warhammer players; The Horse of the Invisible - A Call of Cthulhu scenario; The Philosopher's Stone - Symbolic AD&D adventure; more. 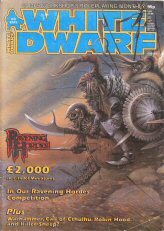 CONTENTS: Haunters of the Dark (Call of Cthulhu); Peking Duck (Golden Heroes adventure); Murder at Flaxton (AD&D adventure); Parlour Game (AD&D); Alternative Magic for Runequest barbarians; Social Customs in Traveller; more. 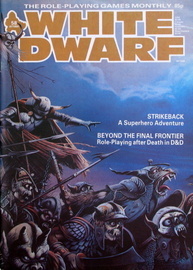 CONTENTS: Artificer (AD&D character class); Beneath The Waves (underwater adventures); Lone Dragon (Traveller scenario); Star of Darkness (AD&D adventure); more. CONTENTS: Rationale Behavior (Golden Heroes); Beneath The Waves, pt 2 (underwater adventuring); more. 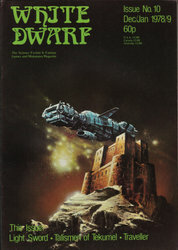 CONTENTS: Tongue Tied - AD&D language system; Reunion - Golden Heroes scenario; Dead or Alive - The Bounty Hunter as a Career in Traveller (plus Type H Hunter, SN Scout Variant ship); In Too Deep - Spicy AD&D adventure; Beneath the Waves part III - Creatures from the Depths - Underwater adventures in AD&D; more. 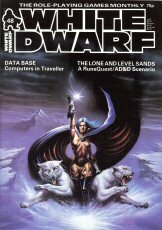 CONTENTS: The Face of Chaos: A view of alignment in Advanced Dungeons & Dragons; Cults of the Dark Gods: Illuminating secrets for Call of Cthulhu; A Box of Old Bones: Intriguing Dragon Warriors/AD&D scenario; Tower Trouble: Illicit Traveller adventure; Monsters Have Feelings Too Two: A touching article for game masters; more. Page 10 is intended to be removed (just advertising on the opposite side), allowing the page to be folded, creating new ad hoc Talisman cards. 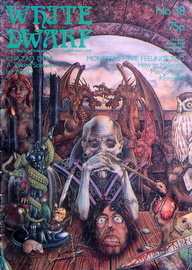 CONTENTS: Jewel in the Crown (Talisman); Fear of Flying - Call of Cthulhu mini-scenario; Neckalce of Brisingamen - high-level AD&D scenario; Origin of the PCs; more. 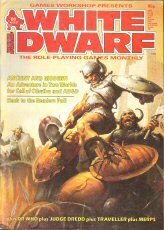 ARTICLES: Power and Politics (Warrior Knights boardgame); Star Spray (AD&D/MERP adventure); Cults of the Dark Gods II (Cthulhu); more. 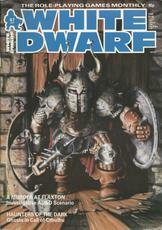 ARTICLES: Terror at Trollmarsh (AD&D adventure); A Company of Wolves (Lyncanthropy in AD&D); Hide of the Ancestor (RuneQuest scenario); Gentlemen and Players (Call of Cthulhu); Alternative Origins (Golden Heroes); more. 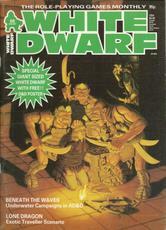 This issue has 4 new powers (Reincarnator, Changeling, Warrior, and Grudge). They are on page 7 and need to be cut/mounted. 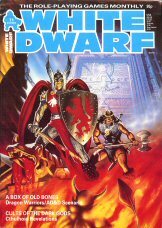 ARTICLES: Cosmic Encounter (4 extra powers); Thrud the Barbarian; Pilcomayo Project (Golden Heroes scenario); Spunng Ones (Judge Dredd adventure); more. 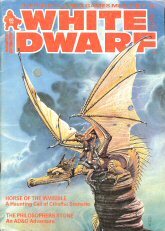 CONTENTS: Where & Back Again - Graham Staplehurst and Middle-earth adventure; All In The Mind - Psionics in AD&D; Ghost Jackal Kill - Call of Cthulhu scenario; Think About It - Use of Intelligence in role playing games; more. 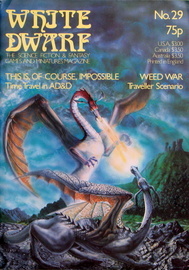 CONTENTS: Combat in Dr. Who; Something Special - Special Abilities for the Judge Dredd game; Clouding the Issue - Detect spells in AD&D; Crime Inc - Gamgs in 20th century RPGs; Things Ancient & Modern - Part One of an epic adventure across time and space for characters in AD&D and Call of Cthulhu; more. 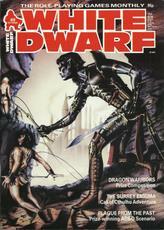 CONTENTS: More Than Skin Deep - Race in AD&D; On The Road - Travelling Encounters in WFRP; Thoughts on Star Trek RPG; Entertainers - New Career for Bushido; Tale to Tell - Gloranthan RuneQuest Adventure; Magic Swords of Pendragon by Greg Stafford; more. CONTENTS: Curse of the Bone - A modern Call of Cthulhu adventure for 2-5 investigators, set in London; Out of the Garden - Gnomes in Warhammer Fantasy Roleplay; Hi-tech fantasy; Mercenaries in roleplaying; Time travel in Judge Dredd; more. CONTENTS: With a Pinch of Salt (Call of Cthulhu); Night of Blood (Warhammer Fantasy Roleplay); Taurëfantô (Middle Earth Role Playing); more. CONTENTS: Paddington Horror - A Call of Cthulhu adventure; Night in the Death of Sector 255 - Mega-City 1 for Judge Dredd; When Mad Gods Laugh - RuneQuest III adventure; More rules for Chainsaw Warrior, plus new cards; more. CONTENTS: Phobias in Call of Cthulhu; Paranoia scenario; On Ealden Bergen - Robin Hood scenario; Friends in High Places - Deception and intrigue in roleplaying games; Arcana or Errata - Criticism of Unearthed Arcana; more.